Human in origin? Obama blowing more smoke? Villagers living in Shortandy, some 70 kilometers north of the Kazakh capital Astana, witnessed the spooky event on Friday afternoon. “It was like a black cloud. We saw it at around 4 pm on April 3. It dissipated like smoke, but it was completely odorless,” Oleg Menshikov, a village resident, told Today.kz. 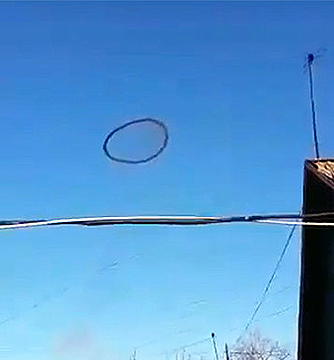 Andrey Solodovnik, associate physics professor at the Northern Kazakhstan State University estimates the ring was about 100 meters in diameter and floated at an altitude of between 200 meters to a kilometre.